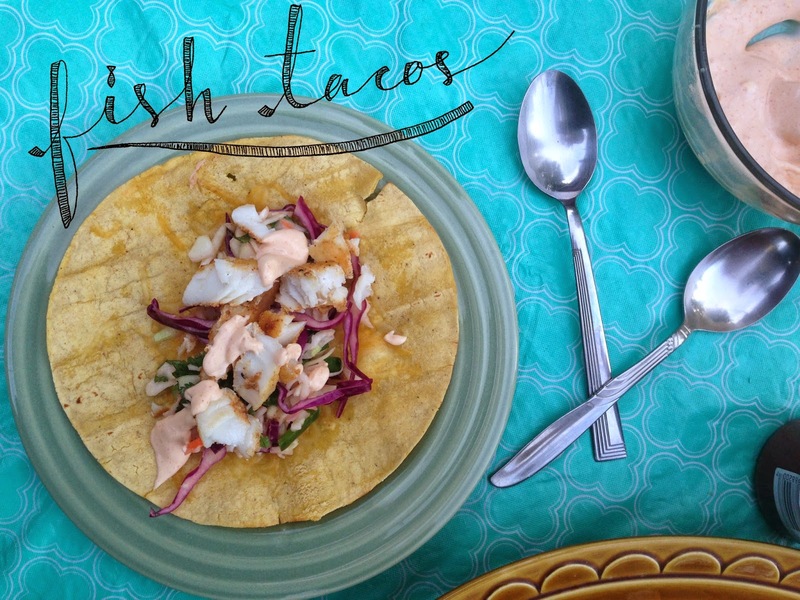 We are jumping right into our Independence Day theme with some Freedom Fish Tacos! What makes them free? Well it's because this 4th of July you are free to make something unexpected, something other than brats and chicken, you are free to make fish tacos, and now you have the perfect recipe and they are federally delicous! Last week while I was doing my menu planning, I decided I wanted to find a way to work more fish into our plan. But I have a secret: I don't really know anything about fish. I don't know how to cook it, I don't even know what fish I like to eat. As a kid the only fish I liked was tuna, on a sandwich. As a teen I discovered sushi, which I love, but something about cooked fish is more, well, fishy. I've been trying to eat different fish and seafood in the past couple years, but it's hit and miss for me. But I know that I like to eat white fish. White fish is like fish for beginners, or fish for weenies, whichever you prefer. So I headed into my local market and talked to my meatman. Halibut and Cod were side by side, Halibut was about $20 a pound and the cod $6 a pound. My meatman and I chatted for a minute about whether the price for halibut was worth it, decided at wasn't and I headed home with a couple of pieces of cod. This recipe starts with a spicy coleslaw. I started with a bag of coleslaw mix (a staple in my fridge), its just shredded cabbage (finer than I can shred myself), a tiny bit of purple cabbage, and carrots. I tossed it with standard coleslaw dressing (vinegar, mayo and sugar). Then I diced up a whole bunch of other stuff to jazz it up with. I tossed everything together, squeezed the lime over top and then splashed in some Tapatio hot sauce for what we call "spark" in our house. This post is not sponsored in any way by Tapatío, but it should be. Speaking of Tapatío, it's totally federal because it's made in the U.S.A. It's also a staple in our household, if you have never tried it, pick a bottle up, it's inexpensive and fantastic. You want to make the coleslaw before the rest so the flavors can have time to marry. Next I threw together a little sauce. I figured it needed something creamy, and with me being lactose intolerant and all, that can be a little tricky. But I had an idea- Tapatío Mayo. Mayo sounds weird on a taco, but it sounds perfect for fish. That's literally just mayo and Tapatío. That's all you need! Now it's time for the hard part, the fish. 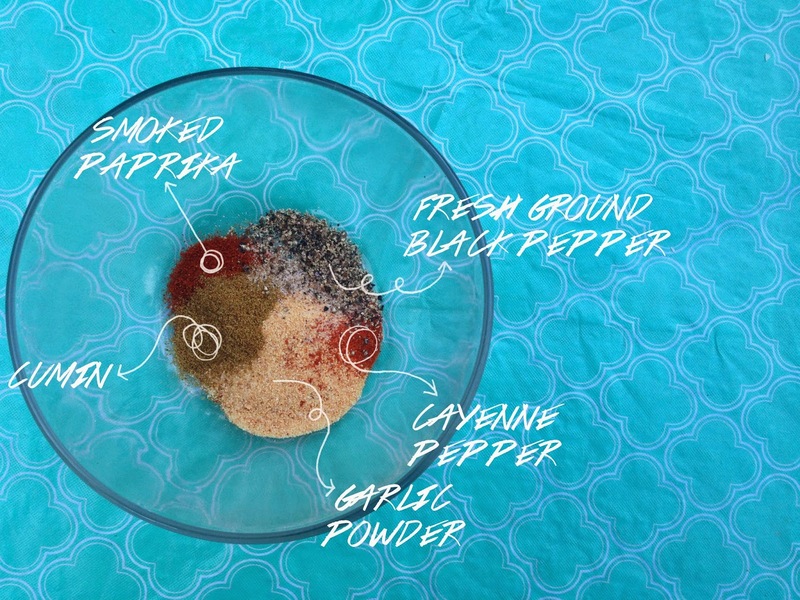 I made a little spice rub and mixed it together. Then I squeezed a lime over the top of the fish, sprinkled the rub over, and patted it in. Then I put the fish in the pan, spiced side down, and did the same thing to the other side. At this point I had fishy hands, and forgot to take pictures until I had already flipped the fish. OK, it's no secret that the lighting is atrocious in my kitchen, so this is as good as it gets. Sorry! Just focus on the other, better lit photos! I cooked the fish a few minutes on each side, and then it was onto setting the table and assembling tacos! I melted cheese onto corn tortillas for the guys, and warmed up a flour tortilla for myself. Then I stacked the slaw, flaked fish and topped with the spicy Tapatío mayo. We all had seconds, and my husband requested the leftover slaw and fish for his lunch tomorrow, that is a sure sign of a successful new recipe! All in all, the fish tacos were easy, inexpensive and yummy. I think they would be the perfect addition to your 4th of July plans. 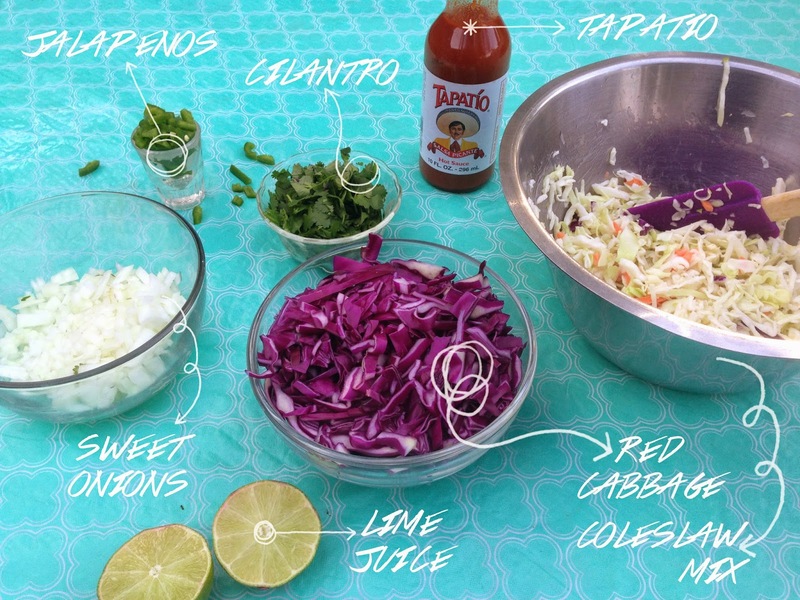 Mix the slaw mix and dressing, then mix in the purple cabbage, jalapeno, onion and cilantro, then squeeze the lime in, and add Tapatío to taste. I used approximately a tablespoon. Squeeze one half of lime over one side of fish, sprinkle half of spice mixture over top and pat into fish. Bring oil and pan up to medium high heat, add fish to pan, spiced side down, squeeze other side of lime, and repeat seasoning process. Cook for approximately 2-3 minutes, or until sides of dish are starting to get firm. Flip fish and repeat.